Discussion in 'News & Announcements' started by ItsAZZA, May 11, 2016.
we want to address questions about Mojang EULA and the latest acts they have taken to enforce it. Please read this thread carefully as it contains important information about the server. Mojang, the creators of Minecraft, have an end user license agreement (EULA) that all players and server owners agree to when signing up for the game. More about EULA can be found here and here. Lately, Mojang has taken up enforcing this EULA full force in making sure that server owners and account holders are not violating any part of it. They have created a server blacklist, which already consist of over 40 servers violating their EULA. Access to those servers is blocked until they decide to comply with the agreement. BuildCraftia is not listed in there, and we never want to get there. Therefore, we are taking an action to comply with the enforced EULA. This means changes to the current ranking system and benefits ranks acquire. Remember: You will not be losing your rank or any item purchases you have made so far. Every rank purchased will keep its current benefits. I have divided the changes into three categories: creative, survival and minigames. I will be thoroughly explaining what changes will happen in each of the three categories. Creative will go through the biggest changes. According to EULA we cannot give players WorldEdit or plots for real money. Also, the access to the BigPlots cannot be purchased with a hard currency (real money). There is also some more minor perks ranks have which will be removed from the newly bought ranks when we fully introduce these changes. The new ranks are going to get more cosmetic features, as they are developed. We are going to fully introduce the Reputation System designed and developed with the new API. It’s a punishing and rewarding system; both at the same time. See the picture down below for more information. NOTE: You only get reputation if you play on that day on the server. If you are banned, you automatically get reputation, until you reach 0. 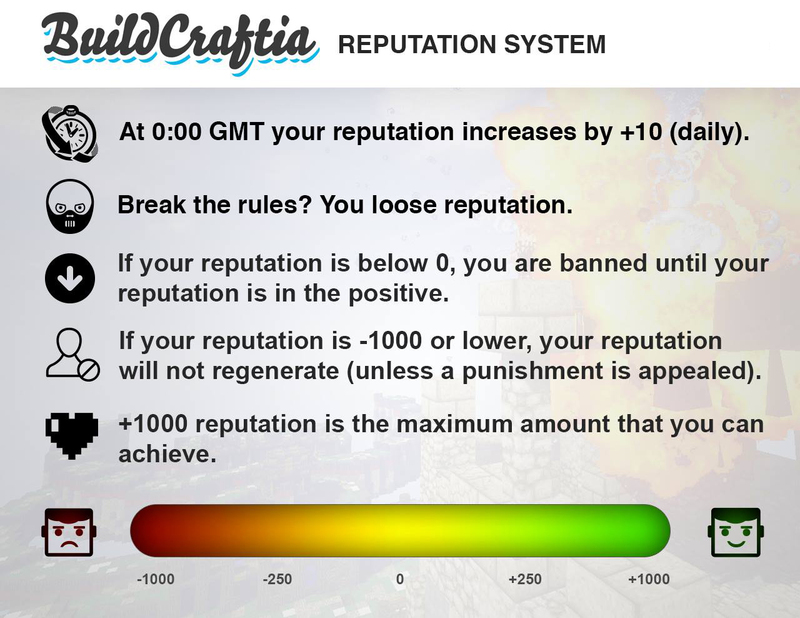 The BuildCraftia Reputation System will give us the chance the reward players from playing in the server and also punish players from breaking the rules. Achieving different levels of reputation, you gain perks in the server. If you are offline for more than one week (not final threshold), you will start loosing reputation 5/day. No, this does not mean you can get banned. You will loose points, until you reach 0. We really want to award players that are active on the network and loosing points for inactivity will take some benefits (mentioned above) from you, but you can easily acquire them back as you gain reputation faster than you lost it in the process. If you log in once in that time, the threshold will start counting from 0. You can acquire the full reputation in 3.3 months, but you can lose all that in 6.6 months (+ the threshold) if you are inactive for that long at once without logging in. Every player gets two basic WorldEdit commands by default: //set and //replace. Yes, we are introducing WorldEdit to all of our players. More WorldEdit commands can be acquired temporarily with the BuildCraftia Network Currency. The currency can be achieved by playing minigames, survival and by voting. Network Currency can also be used to buy temporary perks, just like you can now buy in the VoteShop. Our survival is pretty well balanced, and ranks do not get any benefits. We are going to remove the claim blocks and coins from the webstore. No other changes made in survival. We will also make claim blocks available for network purchases, similarly to how you can get survival money from network currency. All minigame upgrades (kits, skills et cetera) must be purchased with network currency. Neither rank gets the kits for free (except for kits that have always been free). We are going to introduce a global Network Booster, with a cost revealed later. This will provide all minigames with a 2x coin multiplier for 24 hours. I purchased <perk here>. Does this mean I will loose everything I have invested in? No. These changes will only affect new purchases made after this network update. When are these changes rolling in? We do not have an estimate, but we are aiming to launch all this in June, with our 1.9 server update. Will I have to do anything regarding to these upcoming changes? No. These changes are made by the administration team and requires no effort from you whatsoever. If you have any more questions about EULA or changes mentioned above, please contact Quicksteve or myself. Thanks for reading, and as always, have an awesome day at BuildCraftia! LordN826, Miner, Mipsu and 6 others lick this. ItsAZZA and Dusty lick this. One hundred days of steady reputation gaining, and we're already at the top prize. Read the thread. You lose reputation by breaking the rules. How much you lose depends on the rule. Okay, if you lose reputation by 5 a week for inactivity, is it possible to be banned? Remmi, CJR329 and Wordguy lick this. Word's got a point, if someone's just plain inactive for a couple weeks, does that mean they'll get banned? I mean, people have their obligations in real life as well, as we all should, but if they put those ahead of a Minecraft server, they get banned? Doesn't seem logical in my eyes. epikplayer, HestiaMinecraft and CJR329 lick this. No, this does not mean you can get banned. You will loose points, until you reach 0. We really want to award players that are active on the network and loosing points for inactivity will take some benefits from you, but you can easily acquire them back as you gain reputation faster than you lost it in the process. If you log in once in that time, the threshold will start counting from 0. Thanks for your comments on this so far. RazerH, epikplayer and Dusty lick this. I understand you want to reward players for coming on but what if their on a holiday or have other commitments? It seems a bit unfair to punish players just for not being online. Maybe players could have 1 or 2 'freezes' a year to keep their reputation up that week/month? Tbh it doesn't make sense to reward them with reputation points which enable them to have access to plots,worldedit, etc. if they're not there. As azza said also, it only takes a few days to regain enough for world edit. I won't play on this server anymore. I feel like it is a commitment for us to come on if we lose points on the days we are not on. Maybe this can only apply to players who haven't got a apparent reason for playing? But then again, I'm no programmer. Maybe if we finally come on after the threshold, we can state a reason we were away on a little chat box, and if we skip it we lose even more points. The rest is pretty fair though. You won't get banned for not coming online you'll just lose privileges. @staff, if you are inactive will you lose the plots you gain every day? no non-empty plots (aka with more than two blocks of water and dirt on them) will be deleted. ever. period. You won't be able to claim plots for quite some while until you gain the rep again though. What if a person has to leave though? In the last days of June, I'm leaving for the holidays, but I don't wanna have a loss just cause I left for some RnR. Maybe, if you're leaving for a while, due to important things like holidays or visiting relatives in Japan, you could tell or leave a message somewhere, and the rep drop would be frozen for the time the persons gone. HestiaMinecraft, DoctaCirno and Wordguy lick this. We will consider a system like this, thanks for the suggestion. But the amount of reputation you loose versus how much you gain is minimal. Let's say you will be gone for two weeks. Reputation starts dropping after one week, so that's one week of loss, which makes up 35 points per week you are gone after the one week. You can achieve those points back by playing 3.5 days in the server. You are totally fine with these kinds of situations, if they happen a few times a year. If some time you are gone for three weeks, you only loose one week's worth of reputation. And let's say this phenomena only happens twice a year, you should have full reputation nearly always. Dusty, DoctaCirno and Quicksteve lick this. You won't get banned for not coming coming online. You will lose reputation, but you won't get banned like Azza said. Furthermore, you only start losing reputation after a week, and even then it's only 5 points. That would be easily regained because you get 10 for every day you're online.